At first, I simply gave you an overview of where to stay in Sydney depending which walk interests you most. But when I got to the Royal National Park accommodation question, things got trickier. Now I'm diving deep so there's a roof over your head, whether you want hotels, caravan parks, camping tent sites, in-park options or boutique B&Bs. I've also split up the information into whether you have a car, or you're relying on public transport because that definitely changes my Royal National Park accommodation recommendations. 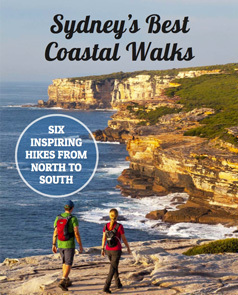 First, choose from the best Royal National Park walks. Then scroll down to browse all your options or click on the heading to skip straight to your preferred accommodation style. This post contains some affiliates where we may earn a small commission – at no extra cost to yourself – if you make a booking after clicking our link. It helps keep this website running, so we're grateful if you do. There are no hotels in Royal National Park because it’s not that kind of place. It’s fine to stay in a city hotel but it’s about an hour away by train or car (check each walk for more details on getting there). If you stay in the city, Town Hall and Central stations go directly to Cronulla, meaning Darling Harbour (see prices for Darling Harbour hotels) and the city centre areas are both good (see hotel prices in Sydney's CBD). The Rocks and Circular Quay area will require a change of train but do offer lots of hotels across a range of budgets (see prices for The Rocks hotels). Like Royal National Park, the airport is on the southern side of the city, so it’s possible to stay at an airport hotel or the Novotel at Brighton Beach after a bushwalk and before flying out of Sydney. You’ll need a car for this option. The ferry to Bundeena in Royal National Park makes Cronulla a worthwhile option. There’s a four star hotel , and serviced apartments, both overlooking the beach (see prices for Cronulla accommodation – Rydges Cronulla, Cronulla Motor Inn and Quest Cronulla Beach). Cronulla also has a YHA that has some private rooms with ensuite. The closest you'll get is Bundeena, a village within Royal National Park. And in Bundeena, it's all about B&Bs (Bed and Breakfasts). For a real escape, try Beachhaven right on the beach. We've stayed at Sanctuary Bundeena which is run by keen walkers and has a very comfy bed. Across the Hacking River, Cronulla SeaBreeze is also run by enthusiastic walkers (und Maria spricht deutsch). While there are, of course, B&Bs all over Sydney, we recommend staying within the Sutherland Shire for closer access to Royal – check out more Shire B&Bs. The southern edge of Royal National Park has B&B accommodation options near Otford. Try Yellow Tail Stay at Stanwell Tops if you have a car. Airbnb does a weird thing when you search for “Royal National Park”. It spits back results for places in Surry Hills, Pyrmont and places that are nowhere near Royal. That’s fine if you’re after a city location (I go into this more when I talk about hotels) but if you’re not from Sydney, it’s hard to pick out the search results that are actually in or near the national park. There are two villages enclosed within Royal National Park. Bundeena is the bigger of the two, with a few cafes, small grocery store and a ferry to Cronulla. There are many day walks from the northern section of the Coast Track that start from Bundeena. The other village, Maianbar is smaller and more reliant on the car to get to the popular bushwalks. I've recently heard about a 3 bedroom house in Bundeena, called Solveena, (on Stayz, not Airbnb, but same idea) which we hope to check out soon. If you plan to get the ferry across to Bundeena, then Cronulla is conveniently located with a cool beach culture. Anywhere in the Sutherland Shire – like Miranda, Sutherland, Greys Point – is within a twenty minute drive to the national park’s northern entrance near Audley. The southern end of the park – great for walks like Burning Palms or an alternative track to Figure 8 Pools – is located near Otford and Stanwell Park. It’s worth looking at Airbnb homes in these locations too. There are three camp sites within Royal National Park and another one in neighbouring Heathcote National Park. Only one – Bonnie Vale – is vehicle accessible; the others are for walkers only. Bonnie Vale is on a protected bay of the Hacking River, looking across to Cronulla. There are 74 sites for camper trailers, caravans, and tent camping beside your vehicle set in beachside bushland with basic, but well-kept, facilities. There's a short bushwalk past Cabbage Tree Basin to Maianbar, or half an hour's walk through the village of Bundeena to get to the start of the Coast Track and day walks like Jibbon Aboriginal Engravings, Wedding Cake Rock and Eagle Rock. **UPDATE SEPTEMBER 2018 ** Bonnie Vale campground is closed until further notice due to fragments of old asbestos containing material coming to the surface on the site. Check the latest official Bonnie Vale campground status. Hikers have another three camping options, all requiring total self-sufficiency (refer to our handy hiking checklist and grab some water purification tablets before you go). North Era is the only campsite on the Coast Track so gets booked out during popular times (like a four month wait for a Saturday over the warmer months). It's a prime beachside location, with 12 unmarked tent sites, non-flush toilets and no water. The other two sites are inland, away from the coastal areas. Uloola Falls campground can be reached by either the Uloola Falls trail east of Waterfall or the Karloo Pools track from Heathcote. Again, it's basic. A bit rocky under foot and well, a bit ordinary too. There are relatively new non-flush toilets but they're about 150 metres away from the tent sites. This national park campground is near the top of the falls so you don't get any great views of the waterfall or anywhere to swim. It's a good base to explore the Audley precinct which is an hour down the hill. An hours walk in the opposite direction gets you to Karloo Pools, which has great swimming. Uloola Falls campground has six unmarked tent sites, taking a maximum of 18 people, and treatable creek water. Book a few weeks ahead in peak times. Our pick of the non-coastal campsites is Kingfisher Pool, west of Waterfall. Like Uloola, it holds up to 18 people in six unmarked tent sites, but unlike Uloola it's next to the waterhole for secluded bushland swimming. There's a non-flush toilet and creek water that must be treated. It's still a bit secret, with availability most weekends. Don't tell anyone! We stayed in the small three-bedroom Weemalah Cottage with friends and loved its riverside and bush setting. The rustic timber cottage has taken to the theme of wood-panelling with gusto. Gladly, it has had a kitchen and bathroom update since our stay. It's twenty minutes drive past the Visitor's Centre at Audley and is a very car-reliant location as there are no formal walking tracks near the cottage. While you'll feel like you have this part of the park to yourself, the river (which you overlook from the verandah) can get busy on warm, sunny days with watercraft. The only caveat is it's not great for young children; the house itself is fine but the outdoors area is hazardous for very young kids. I would love to stay just up the road from Weemalah at Hill Top Cottage. It's a beautifully restored three bedroom house overlooking the Hacking River. Again, you'll need a car to access other areas within the park but the location itself is bliss. For walking tracks near where you're staying, choose Reids Flat Cottage at Audley. The only caravan park in Royal National Park (and therefore operated by the National Parks Service) is at Bonnie Vale, at Bundeena. There are 74 sites either beachside, or bushside for camper trailers, caravans, and tents. All sites are unpowered and there are basic, but well-kept, facilities. There is often kayak hire available and there’s a short bushwalk starting at the caravan park to Cabbage Tree Basin and Maianbar. Bundeena has a few cafes, small grocery store and a petrol station. It’s a great access point to walks in the northern part of the park (see Camping and Camp Sites). Other nearby caravan parks that cater to caravans and motorhomes are a means to an end, rather than a destination in their own right. Sydney Tourist Park at Miranda is convenient to a motorhome rental outlet and shopping centres. Heathcote Tourist Park caters mainly to long-term residents (and has no website). Forget about the city, that’s the whole point right? If you really want to get away, stay right in the park. I’d choose either a B&B in Bundeena if it’s just you and a (special) friend, or an Airbnb or house rental in Bundeena if it’s you and a few friends. Ideally nab a National Parks cottage to truly escape. If you're a first-time visitor to Sydney and want to squeeze in a hike as well as all the big sights, then it may be easier just to stay in a city hotel like Swissotel Sydney or Hilton Sydney (luxury hotels with central locations, close to Town Hall station, shopping and sights – check prices), and spend a bit of time travelling back and forth. Read the hotels section above, and see our itinerary suggestions if you only have 24 hours in Sydney. If you’ve visited Sydney before and looking for a more immersive, local experience, then do what locals do and see Weekend Getaways above. Depends what you mean by “group”. The Royal National Park cottages sleep up to six people. This Airbnb in Stanwell Park at the southern end of the park looks nice (I have no direct experience of it though) and sleeps up to 10 people. I’ve been to a glorious bush wedding at Lilyvale where the immediate family of the bride and groom also stayed for a few days (up to 10 people). If you’re like, no seriously, I mean group accommodation, then try either Govinda Valley with up to 80 people across 18 rooms (and very tasty vegetarian and vegan food). Or one of four sites within Royal National Park run by Youthworks Port Hacking Conference Centre accommodating up to 400 people. Just be aware that the former serves “the wider spiritual community”, specialising in yoga and meditation retreats, and the latter is Christian, specialising in outdoor education. If you have a car, every accommodation option is open to you. Keep in mind that parking at hotels will cost extra. And you’ll be paying park entry fees for your car too. Driving from the city centre to and from Royal National Park in peak hour will feel like eternity, so take advantage of your location freedom by choosing accommodation closer to Royal. The availability of hotels – particularly 4-5 star hotels – thins out the further from the city centre. But that’s where B&Bs and Airbnb places start to pick up, while still maintaining some quality options. Avoid staying anywhere on Sydney’s northern side, for convenience’s sake only. That Harbour Bridge is a psychological as well as physical barrier (!) but realistically you’d be better off visiting Sydney Harbour National Park, or Lane Cove National Park, or heading up to Barrenjoey Lighthouse instead if you find yourself staying with friends on the Northern Beaches. Royal National Park marks the border of Sydney’s south and Wollongong’s north, so consider a coastal drive to top off your visit, discovering Sea Cliff Bridge on Grand Pacific Drive. There are four public transport access points to Royal National Park, but only a few that also have accommodation. Staying in the city centre then catching the train to Waterfall, Heathcote, Otford, or Cronulla (then a ferry from Cronulla to Bundeena) will get you in to the park. That means all the Sydney city hotels are good to stay at, even if they’re not especially close. 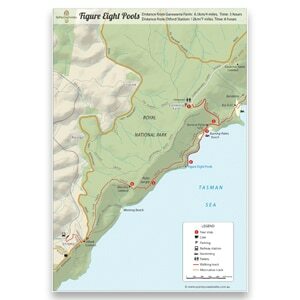 Be sure to research your preferred bush walk as these entry points are only appropriate for certain walks. For example, you cannot get to the Coast Track from Loftus, Waterfall or Heathcote stations. There’s really no accommodation at Otford that is within walking distance to both the train station and national park. Same with Waterfall and Heathcote. That leaves Cronulla, a beachside suburb, as a non-city option. It has a hotel, self-contained apartments, B&Bs and Airbnbs (check prices for Cronulla accommodation). The ferry wharf is near the train station, with ferries departing every hour to Bundeena with access to walks like the Coast Track. Or try Bundeena within the national park. There are B&Bs and Airbnbs. It’s a 25 minute walk from Bundeena ferry wharf around to Bonnie Vale campground if you have a tent. Then, if you’re up for a two day hike, you could stay at North Era campground too. There are enough hotels and campgrounds in the area, that whichever Royal National Park walk you choose, there's somewhere to stay to suit your style. Tagged Accommodation, Royal Coast Track, Royal National Park. Tara Wells is a journalist and former TV and radio producer/presenter who’s delighted to combine her love of hiking with story-telling.